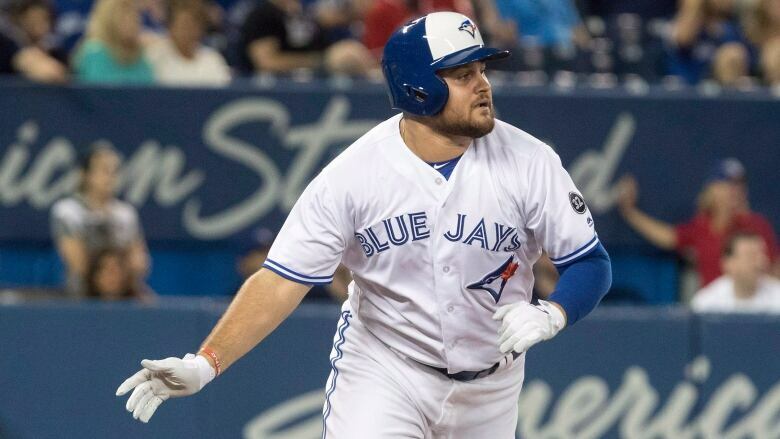 Rowdy Tellez stood in the arrivals section of Toronto's Pearson International Airport past midnight, waiting to tell his dad Greg the great news: he'd hit a double in his first Major League at-bat, driving in a run in the Blue Jays' 10-3 win over the Tampa Bay Rays earlier Wednesday night. The younger Tellez had hoped to surprise his father, but instead his dad greeted him a warm embrace after his cell phone had been filled with texts and calls before even taking off from their hometown of Sacramento, Calif.
"When he saw me he started tearing up a little bit and gave me a big hug. He was really excited," said Tellez in Toronto's clubhouse on Thursday. "It's something that me and him worked for, for a long time. All the hours we spent working at it, all the time he spent after work when he was tired. "He did everything for me. He's always been there for me and did everything baseball related with me forever. First coach, first everything." Greg's flight had been delayed by hours, forcing him to miss his son's debut, a pinch-hit appearance in the sixth inning where he scored Aledmys Diaz. Rowdy had been called up from triple-A Buffalo on Tuesday. He's hitting .270 with 13 homers and 50 runs batted in for the Bisons this season. Rowdy's MLB debut came two weeks after his mother Lori lost her two-year battle with brain cancer, making the airport reunion with his dad even more emotional. "It was pretty bittersweet, to be honest," said Tellez. "I'd say most guys get their first career hits with their whole families, both their parents, in the stands. I was fortunate enough to have one in the stadium with me. My mom was there. She was watching over me. "My dad was on his way so it was pretty bittersweet. I always thought I'd do it in front of both of my parents. But everything happens for a reason." The 23-year-old first baseman has had the full support of his teammates in the Blue Jays organization both off and on the field. "I know his mom's situation was wearing on him the past couple of years, naturally," said Toronto manager John Gibbons, who described Rowdy as tremendous and special. "That can't be easy to deal with, y'know? I mean, gosh. He's a youngster too and that's family. I'm proud of him. I expect him to do really well while he's here." After getting picked up at the airport Rowdy and Greg stayed up late talking about baseball and what the future holds in the Blue Jays organization. Then they woke up early the next morning to go out for breakfast and explore Toronto, a city where Rowdy hopes to spend all of next season. "It's pretty exciting to have him here, pretty emotional," said Rowdy. "It's a great city. I've been here once before. It's a beautiful city, a huge city with a lot of history. It's pretty joyful to be here."